Claire in Tuba Town: Pigeons: To what end? The sale of pigeons does indeed raise the question of why one would want one and what one would do with one when one had one. My first thought was to send messages with it. You know, the old carrier pigeons -- you could tie a note to its leg and it would fly to the desired person. Now this thought of carrier pigeons led me to do some pigeon research and the results were alarming. Absolutely alarming. In what way alarming? The quantity, the sheer mass of information on pigeons. The first thing I read about the pigeon didn't actually surprise me, because it is something that I became alerted to by being a German speaker, and that is that pigeons and doves are in the same family. In German, both the pigeon and the dove are called "Taube", which I find most insulting to the doves of this world, but the Germans pay my words no heedance. At any rate, their are more subspecies of pigeons and doves than I care to count and they all look suspiciously like pigeons if you ask me. The common pigeon, which we all know (and hopefully despise), is called the rock or feral pigeon and it is native to Europe, North Africa, and Southwest Asia. By some streak of bad fortune or more likely stupidity, the rock pigeon was introduced to North America in 1606, more specifically, to Nova Scotia (a shout out to all my peeps in Canada!). And while I dislike pigeons very much, I was quite impressed to read that among the things that pigeons have been trained to do is to differentiate between impressionist and cubist paintings, although on second thought, that's really no great feat . . .
Also fascinating are the efforts to rid cities of the pesky animals. In Tübingen we have a pigeon house that is used in pigeon population control. You see, they lure the pigeons in with this cushy mansion of a place and then steal their eggs and replace them with plaster eggs. Imagine waiting weeks and weeks only to find that your 'baby' is simply made of gypsum. And considering pigeons ability to differentiate between different periods of painting, they may well be able to differentiate between real and plaster eggs. Although really, the fact that they're still living there says a lot. Either they haven't noticed or they think they've hit the jackpot -- lay all the eggs you want and no kids to take care of (they're not called kids, they're called squeakers or squabs). Ken Livingstone, London's mayor, has issued a ban on feeding pigeons in Trafalgar Square. Brilliant idea, Mr.Mayor, brilliant! If only the animal rights activists didn't feel the need to write a musical number about it . . .
Alright, so at this point both my depths of my distaste for pigeons as well as my wealth of interesting pigeon information is coming to an end. But before we go, did you know that pigeons, like flamingos, produce "crop milk" to nourish their young? They make this "crop milk" stuff by "a sloghing of fluid-cells from the lining of the crop" which is an upper part of their digestive track -- yummy. Which brings us back, although I'm not at all sure how, to the carrier pigeon. I left this for the end because of it's totally freaky and disturbing nature -- you know, for effect. 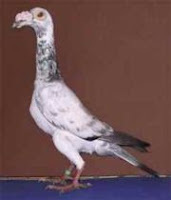 Here, my dear friends, is a picture of a carrier pigeon. It doesn't even carry anything! It is actually the homing pigeon that can carry important messages written on thin paper very long distances. If I were the homing pigeon I would be pretty t'ed off that the ugly carrier pigeon took the good name, but who am I to say, maybe the carrier pigeon has a superior personality to the common and homing pigeon and isn't actually as despicable as I assume. Also, for more interesting and helpful information on animals, see my previous post on porcupines and hedgehogs. The comments after it are really fantastic as well. During the course of my research I also found this blog about pigeons -- once again, not sure what to think. Certainly someone on the other side of the debate but even though I'm a pigeon-hating extremist, I can still listen to what the other side has to say. those are the only languages i personally can comment on, but you must see... we're in the minority. germany has one upped us once again. Or, dear Joyce, We've one upped Germany! Do you think you could post that video you made for me? Just to show your readers how much time you actually spend thinking about pigeons. This was the best post ever. I don't think I'll ever be able to blog again until it is destroyed.